Home » Game Reviews » Area 1851: Express – Aliens Invade the American West! Written by: KristaG on March 22, 2019. While most people have probably heard of Area 51 out in Lincoln County, Nevada, I can assure you that not too many people know of a place known as Area 1851! 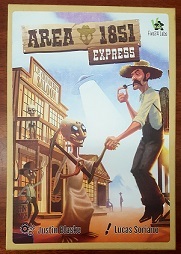 Based on a board game of the same name, Area 1851: Express is a 2-5 player card game set in the midpoint of the Westward Expansion of the 19th Century. Just 4 years after the release of Area 1851, Five24 Labs is bringing Area 1851: Express to Kickstarter on March 25th! Both games introduce players to an alternate history of the American Frontier by adding in, you guessed it, aliens! These particular aliens (a.k.a. Krukians), however, have come to Earth looking for trade instead of trouble and have garnered the attention of not only the passing caravan of settlers but the local natives as well. With the 3 factions working together to blend technologies and “modify” their “Gadgets,” the real profit isn’t in actual cash, but in building one’s reputation! Area 1851 and Area 1851: Express were both designed by Justin Blaske and feature the artwork of Lucas Soriano. Soriano has also provided illustrations for other games such as Black Orchestra, Battles of Westeros (the “Brotherhood without Banners” expansion specifically), and A Game of Thrones: The Card Game – Chasing Dragons expansion. Blaske, on the other hand, is probably best known currently for his games Mint Works and Mint Delivery. For this particular review, all photos were taken using a prototype so artwork and components are subject to change with the progression of the Kickstarter campaign. Setting up a game of Area 1851: Express is both simple and quick. Each player (or “Tinkerer”) is given a player board to place in front of them to designate their play space. 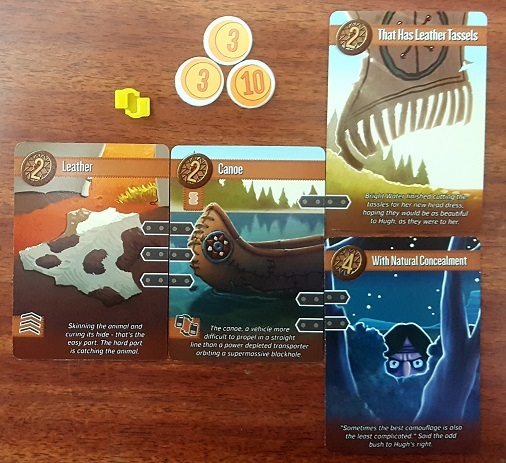 The Reputation Tokens and Effect Tokens are placed in their own respective piles within reach of all players. Next, the 6 red “Thing” cards are shuffled and placed face down near the tokens. 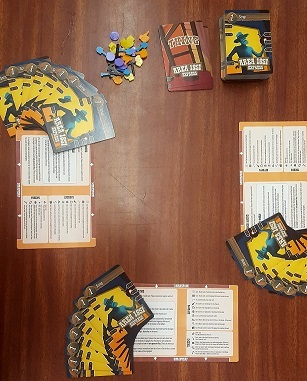 After shuffling the “Scrap” cards, each player is dealt 7 and the remaining cards are placed into a face-down draw pile next to the “Thing” cards. Once a first player is chosen, the game is ready to begin! This Gadget scored a whopping 16 Reputation points! Area 1851: Express is played over a very quick 3 rounds, which are made up of several turns. On a turn, players will select a card from their hand, place them face down in front of them. 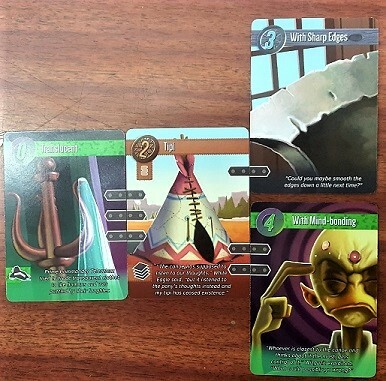 Once all players have made their choice, all selected cards are revealed simultaneously. These cards are either placed in the player’s “Workspace” as a Base to start a new Gadget, added to a previously started Gadget as a Mod, attached to a Gadget as Scrap (flipped back facedown and counted as 1 point when a Gadget is turned in), placed in the player’s “Scrapheap” for use as future Scrap, or discarded face up and replaced with a Thing card. Should a Gadget have been completed during this turn, it is “delivered” by reading the name of the contraption out loud, earning Reputation for the Gadget (as well as any bonus Reputation earned by effects), and receiving any Effect tokens awarded by any of the cards used for the Gadget. All cards from the completed Gadget are added to the discard pile. Once this is all completed, players pass their hands to the next player. This continues until are cards have been played. During the 1st and 3rd rounds, cards are passed to the left and to the right during the 2nd round. At the end of each round, all unfinished Gadgets are “scrapped” and placed in players’ Scrapheaps (“Thing” cards are simply discarded). If it is the end of Round 3, however, all players have one last opportunity to complete any of their Gadgets using cards from their Scrapheap as a last ditch effort to earn extra Reputation. Any Gadgets finished in this fashion are delivered for Reputation points only and do not trigger any effects. The player with the most points at the end of the game wins. One of my favorite and most random Gadgets that I have ever made during a game of Area 1851: Express! One of my favorite things about this game is the drafting mechanic! However, I feel this specific mechanic works better with higher player counts than 2. My significant other and I did thoroughly enjoy playing 2 player games, don’t get me wrong, but knowing you were going to get most of those initial cards back really altered the strategies we used compared to larger games where would only get to see maybe 2 or 3 of those same cards come back around. Another thing I really loved was all of the crazy Gadgets we were able to make! Did my Tipi really need to be translucent and have sharp edges and mind bonding? No, but it grew my reputation and, admittedly, probably made it way prettier and appealing to my potential buyers! Area 1851: Express is incredibly family friendly from the art to the jokes to the ease of gameplay. As long as players are either able to have the icons explained to them (through reading or having someone else explain them) or have them memorized, I feel even younger children can have a good time playing this regardless of the 14+ written on the box. Having never played the board game version, I am now extremely curious how it plays now that I’ve played the “express” version as a card game. Perhaps one day I’ll pick that up too and give it a whirl as the theme is one I don’t see very often – don’t worry, I’ll be sure to let you know if I liked it or not! As I stated above, the Kickstarter campaign launches on Monday, March 25th and I’m really hoping I can beat the line and be backer #1!